Six days after the earthquake that rocked Japan and left thousands dead, the nation is now struggling to avert disaster at its Fukushima Daiichi nuclear power plant. Events have moved fast and risks are hard to assess. The worst nuclear accident in history was the Chernobyl explosion of 1986 in what is now Ukraine. Nuclear experts have repeatedly stated that the Japanese situation cannot get as bad as Chernobyl. New Scientist explains why. What has happened so far in Japan? Following Friday's magnitude-9 earthquake off the coast of Japan, the nuclear reactors at Fukushima Daiichi automatically shut down – as they were meant to. However the cooling systems have repeatedly failed, leading the cores of some of the reactors to overheat. This has led indirectly to explosions damaging both the outer buildings and parts of the containment systems intended to prevent radioactive material from escaping. Because of these breaches, some of that material has got into the atmosphere. Additionally, ponds containing used fuel rods have been overheating, and could potentially lead to more contamination. We published a detailed rundown of events so far on 15 March, and you can follow the latest developments on our Short Sharp Science blog. Chernobyl is the only event ever to be given the maximum rating of 7 on the International Nuclear and Radiological Event Scale, which measures the severity of nuclear accidents. This means it released a major amount of radioactive material that covered a wide area. It's too early to say how the Fukushima Daiichi incident will compare. The Japanese authorities provisionally put the event at level 4, a "local accident". Earlier this week, however, the French nuclear agency rated the disaster as at least a level 5 or 6. What is different about the Fukushima Daiichi accident? The Chernobyl reactor was actually running – albeit at low power – at the time of the accident there. By contrast the Fukushima Daiichi reactors automatically shut down as soon as they felt the earthquake, by inserting control rods so the nuclear reactions in their cores began slowing within seconds. This means that, from the outset, the amount of heat being produced was much smaller than at Chernobyl. So why couldn't a runaway reaction happen at Fukushima Daiichi? The Chernobyl reactor had a fundamentally different design to those at Fukushima Daiichi. Chernobyl ran on unenriched uranium, which is a fairly weak nuclear fuel. In order to use it, the reactor was designed in a way that made it easier for the nuclear reaction to accelerate. This allowed it to generate useful amounts of power, but it also left it vulnerable to running out of control. Fukushima Daiichi runs on more powerful fuels than Chernobyl did, mostly enriched uranium. In contrast to the Ukrainian reactor, its design minimises the nuclear reaction unless its human operators boost it. "You have to actually try to make it go," Bluck says. Ordinarily the reactor cores are surrounded by water. Heat from the nuclear reaction boils the water, creating steam that drives turbines which generate electricity. In doing so, the water also helps to cool the reactor. But crucially, the water is also a "moderator": it helps keep the uranium fission reaction going by slowing down neutrons produced by the reaction as they hurtle out of the fuel rods. Slow neutrons sustain the reaction, by liberating still more neutrons and heat from uranium atoms in the rods; fast-moving neutrons just pass straight through the other fuel rods without colliding with other uranium atoms. If the water heats up too much, however, bubbles form within it and these allow the neutrons to escape, slowing down the nuclear reaction. Effectively, if the coolant overheats, it starts shutting down the reaction without any human intervention. "It's a brilliant solution," Bluck says. Nuclear engineers call this a "negative void coefficient", because having voids – bubbles – in the coolant slows down the reaction. By contrast Chernobyl had a positive void coefficient, so the reaction was more likely to accelerate. 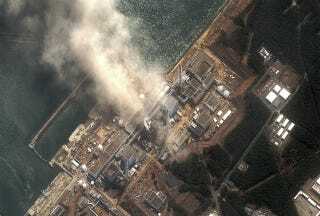 Could Fukushima Daiichi catch fire like Chernobyl did? There have been some small fires on the site, all of which were put out rapidly. In one case the Japanese authorities initially said that one of the spent fuel ponds was itself on fire, but this was later retracted and it remains unclear what actually happened. In another case, the fire has been attributed to diesel engines pumping water into the reactors. All of the fires seem to have been outside the pressure vessels that contain the core of radioactive fuel rods. At Chernobyl the pressure vessel was breached and the reactor had no containment. There, the core itself burned fiercely, largely because it was made of graphite – which was used as the moderator. This did not make the accident more likely, explains Bluck, but once the reactor exploded the graphite made the situation worse, because it burned so readily. The fires carried radioactive material from the reactor core high into the atmosphere, where it spread far and wide. This could not happen at Fukushima Daiichi, as it does not use graphite as the moderator. What is the worst-case scenario for Fukushima Daiichi? It's difficult to be definitive, because information is limited and often confused, and the outcome will depend on the decisions the plant's operators take. But at the moment the reactors themselves seem to be largely under control and are cooling rapidly. The control rods, which absorb neutrons and dampen down the nuclear reactions, have been in since Friday, and the reactors have been suffused with seawater laced with boric acid – another neutron absorber. Because of the reactors' negative void coefficients, the nuclear reactions cannot now restart unless those actions are reversed. "There is no scope for there to be criticality," Bluck says. Meltdown would only become possible if, for some inexplicable reason, the operators were to undo all they have done to date to control the reaction. There have been some leaks of radioactive material and will probably be more, partly because containment systems have been breached, and partly because radioactive steam must be regularly vented to allow more water in. The biggest threat now seems to be the spent fuel ponds, where the water level has fallen and temperatures have risen. That could lead to the fuel rods breaking open, releasing their radioactive contents. Bluck is surprised that the ponds are proving so problematic, because unlike the reactor cores they contain no high-pressure steam making it hard to pump in cooling water. The ponds are a standard feature of nuclear facilities, and are typically designed to ensure that nuclear reactions cannot restart in the fuel rods: among other things, the rods should be widely spaced in the pond. However, the company operating Fukushima Daiichi has now said that, for the fuel pond at reactor 4, "the risk of recriticality is not zero", meaning a nuclear chain reaction could restart in the rods. Quite how this has come about is unclear. But adding boric acid to absorb the neutrons should stop the reaction before it starts.